As well as reading on line, you can also check out the eBooks, which include both .epub and .mobi versions. 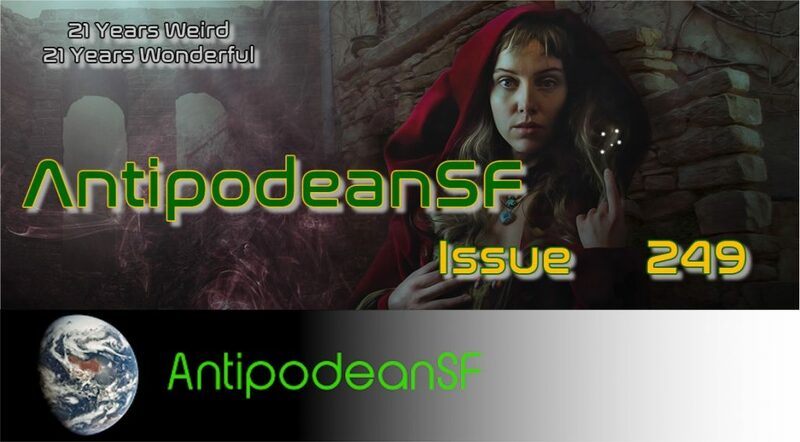 While we’re on the AntipodeanSF train, I should say that Issue 250 will be absolutely huge. Forty-five plus speculative stories from the community of authors who have contributed to AntipodeanSF over the years. There are so many stories that website copy will remain online throughout May, June and July, with normal monthly publication resuming on August 1, 2019 with Issue 251. Nuke (AntipodeanSF’s editor) is even creating an “on demand” printing option, so you can even get this mammoth edition using dead trees and special, one of a kind ink (*). How can you resist! (*) Actually normal ink, made special mostly by the magic of the stories it will trace out on the page.